We offer a wasp eradication service for your home and business. Wasps are the pest that causes most distress to our customers. Wasps can be very aggressive and wasp stings are very painful. In susceptible people, these stings can lead to an extreme allergic reaction in the form of anaphylactic shock. They can ruin an outdoor meal or a relaxing drink in the beer garden when they are attracted by our food and drinks. When they nest in our properties and are accidently disturbed, they can impart multiple stings. 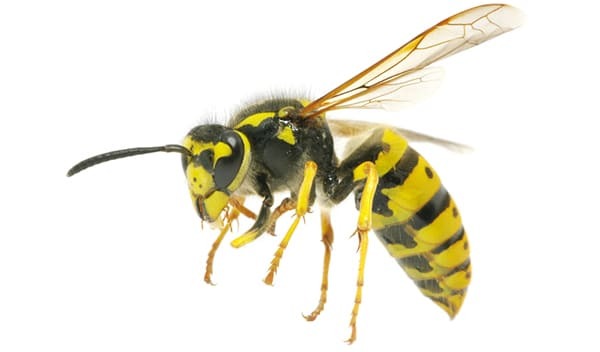 Kestrel Pest Management are experts in wasp nest eradication and wasp nest removal. 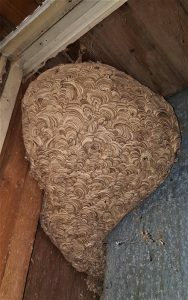 We have many years’ experience dealing with wasp nests and utilise the latest products and techniques to ensure the successful eradication of any wasp nest. Sometimes people are unsure if they have wasps or bees. 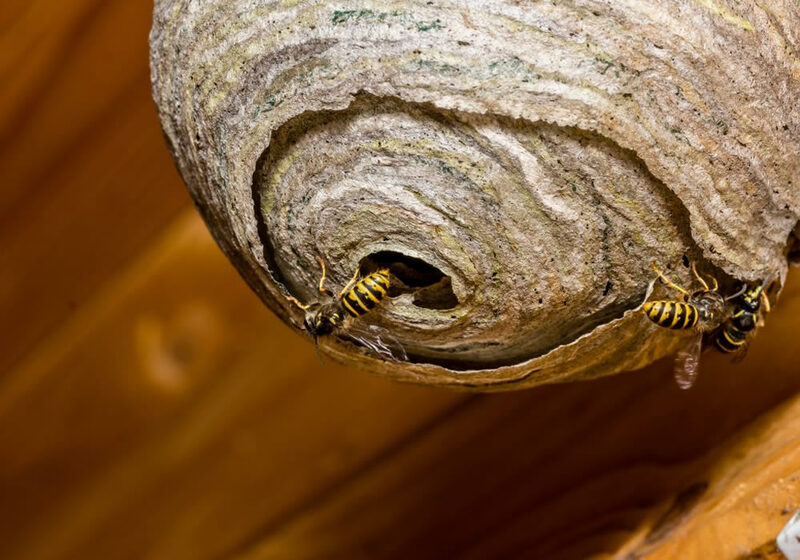 Our qualified wasp expert will conduct a thorough property survey and if a wasp nest is confirmed, an eradication treatment will be carried out. We will identify the location of the nest and any access points the wasps are using to ensure a successful eradication. We have a range of specialist equipment and products that will allow us to gain access to difficult to reach nests. We will ensure all safety precautions are in place to minimise the risk to people and pets. Detailed reports will be left you, informing you of the treatment process. Wasp Stings: Wasps will sting if they or their nests are under threat. Therefore, when we are innocently getting our gardening equipment out of the shed or putting items in the loft for storage, and there is a wasp nest present, we will trigger an attack response. As the wasp stings it releases a pheromone that tells the other wasps to also attack, which can often result in people being stung multiple times. We have known some quite severe wasp attacks when people are window cleaning or hedge cutting and inadvertently get too close to the wasp nest. Pets and children can be particularly at risk from being stung due to their inquisitive and generally active nature. The anatomy of a wasp sting is unlike that of a bee, in that the stinger is straight and barbless. This allows the individual wasp to sting multiple times without self-harm. In honey bees the stinger is serrated and therefore unable to be withdrawn, which causes death to the bee when part of the abdomen becomes detached when trying to pull away. The yellow and black colour of the wasp warns potential predators that there is danger associated with trying to eat them. This warning colouration as a deterrent is called aposematism and has evolved many times in a variety of species with strong defences and is termed Mullerian mimicry. Apply a cold compress directly to the area of the sting. Raise or elevate the affected area to help reduce swelling. Wasps Ruin Outdoor Leisure: Wasps can ruin outdoor activities during the Summer. Wasps are attracted to food and drinks when we are having BBQ’s, picnics and enjoying drinks in pub gardens. Wasps will enter drinks cans and bottles, with the potential of the wasps causing stings whilst being consumed. It is always a good idea to cover drinks containers between drinking when wasps are about. We have known food vendors, at shows and fetes, having to pack up early due to the constant contamination and irritation cause by foraging wasps. 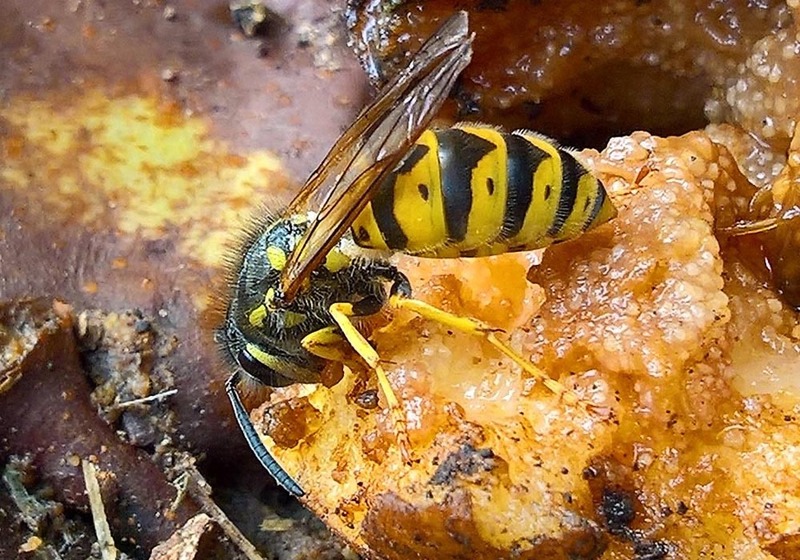 Wasp Contamination: During the Summer the worker wasps start to concentrate on feeding themselves, rather than foraging to feed the larvae within the nest (See Wasp Life Cycle Below). This results in wasps honing in on sweet smells emanating from factories, schools, hotels, pubs, shops and homes. This introduces the risk of wasps landing on and contaminating food or actually being incorporated into the food during processing. Needless to say, a customer finding wasps in his meal would not be a happy customer. How do wasps get in to a house or business? Wasp Nests Within the Property: Wasps will quite happily use our homes and businesses to make their nests. They will nest in our properties as this offers a secure environment that has a stable climate and is free from predators. 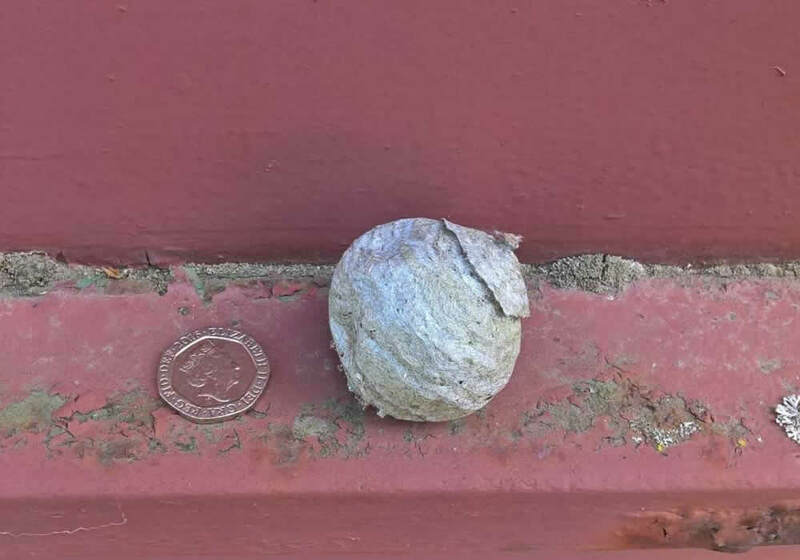 We at Kestrel Pest Management have found wasp nests in nearly every location you can think of including vehicle engines, traffic lights, security cameras and garden parasols. The most usual places that wasp’s nests are found are airbricks, soffits, loft spaces, sheds, garages, bird boxes and holes in the ground. It is the queen that establishes the nest and it is her that will select the location based on several factors: resource availability, security from disturbance and temperature. Depending on the location of the nest within the property, this can go unnoticed for quite a while. Nests that are at lower levels are often identified first, with higher level nests being overlooked until the number of wasps inside the nest give away their location with their constant foraging flights. Foraging Wasps: When the worker wasps start foraging for themselves, rather than for the colony, their preference for sweet foods causes them to enter homes and businesses to satisfy their cravings. The aroma emanating from domestic kitchens, food factories and food retailers has an irresistible lure to wasps. Once a suitable food source has been located, the wasp will pass this information on to other workers within the nest. This results in food venues being quickly inundated with wasp activity and it is at this time that most wasp stings occur. Flying Wasps: The foraging behaviour of wasps results in a constant flight path of wasps returning and leaving the site of the wasp’s nest. The activity levels increase as the nest increases in size, meaning there can be much less activity when the nest is small, compared to when the nest has been established for some months. 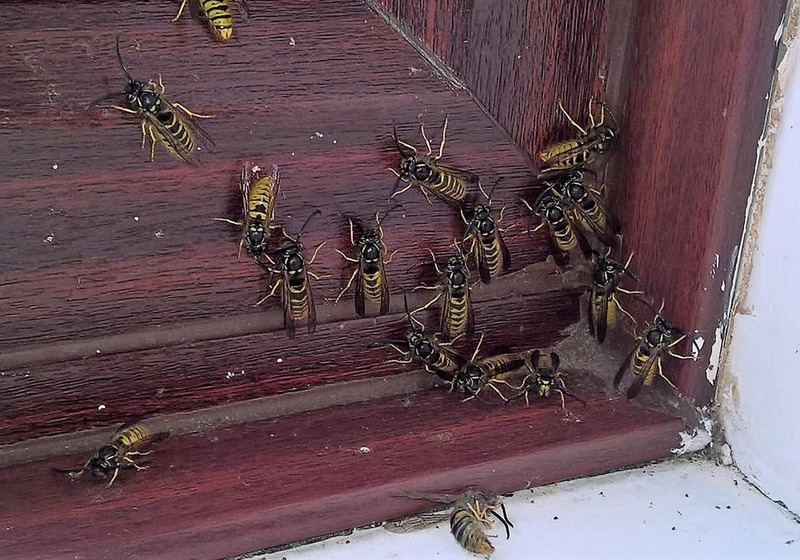 If the nest has been built in the roof space or within the cavity wall, the light source from the living areas of the home can attract the wasps to investigate. Often when people enter their lofts and inadvertently turn on a light or use a torch, this will attract wasps and trigger an attack response from the wasps, resulting in the unaware person being stung. Wasp Nests: Wasp nests are an engineering marvel and are a thing of beauty when observed up close. The initial starter nest, that is constructed by the queen, is no larger than a golf ball and these can often be seen suspended from the roof beams. As the Summer progresses, these nests increase in size exponentially and some can reach the size of a beach ball. Free hanging nests are suspended from roof beams of lofts or sheds and are readily seen. Other nests are constructed within the confines of cavity walls, sub-floor voids, holes in the ground or dense bushes. These hidden nests can be the most dangerous as they are often approached by unsuspecting people. Wood Chewing: The building material used to make nests is wood pulp that the wasps obtain from any wood-based material. They will mix the chewed wood fibres with saliva to make a type of papier mache, which they will then use to construct the cells and outer structure of the nest. Any wooden material can be prone to attack by wasps such as fences, garden furniture and sheds. When they are scraping away the wood fibres, they make a scratching noise that can be heard from several feet away. 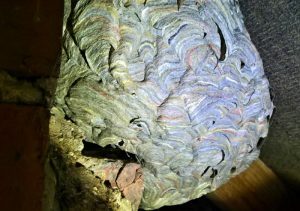 We have regularly seen wasps’ nests with red and green coloured lines in their structure, which is the result of wasps chewing up wood that has been painted. Wasp’s Buzzing: Wasp’s nests can often be heard before they are seen due to the loud buzzing within the nest. This buzzing is caused by wasps using their wings to control the temperature within the nest. During hot spells, worker wasps will bring water back to the nest and use this to cool the nest by means of evaporation. It is important that during our initial survey of the property that we ascertain that it is wasps and not bees that are present. Dependent on the location of the wasp’s nest, we have several products and techniques that allow us to successfully eradicate the nest. If the nest is exposed, we will treat the nest directly and if the nest is concealed, we will treat the access points leading to the nest. Insecticides: We have an array of professional insecticides that can be deployed against wasps and each of these have their unique advantages in differing circumstances. 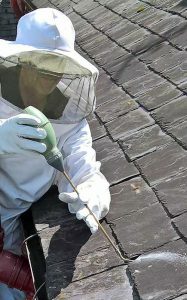 The hidden location of wasp’s nests sometimes requires specialist equipment to be able to effectively and safely deliver the insecticide to the nest. 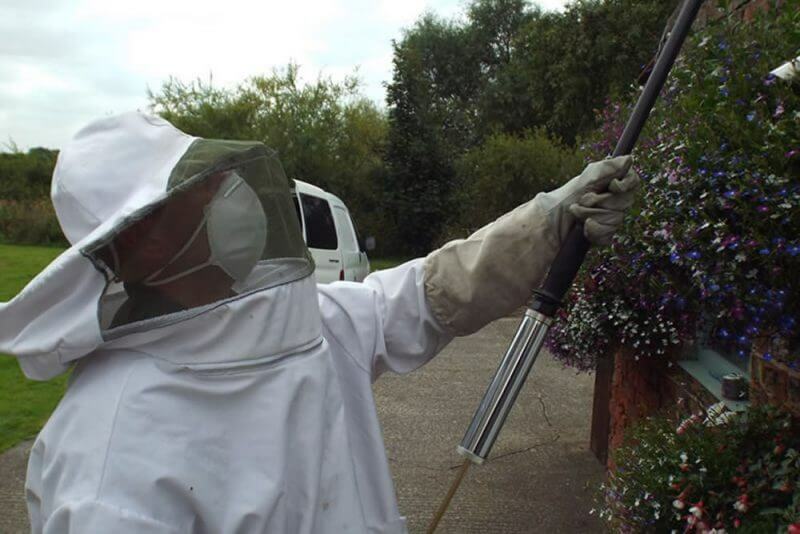 Kestrel Pest Management use the latest equipment to be able to reach and eradicate any wasp’s nest. Proofing Work: Wasps using gaps in the cavity walls to nest can easily be prevented by using proofing products to deny wasp access. We can mesh airbricks using a fine steel mesh and we can seal gaps in the walls of buildings using silicone sealants. Appearance: The worker wasps are 12 – 17mm long, have distinctive black and yellow banding, and have a prominent black anchor shape on its face. The queen wasp is 20mm long and has similar colouration to the workers. The male wasp(drone) is around 18mm long, has much longer antennae and has a similar colouration as the workers. Life Cycle: The life cycle described will be that of the common wasp. However, the life cycles of all the Vespidae wasps are quite similar. Queens wake up from hibernation: The queen wasp wakes up in the Spring after hibernating over the Winter. She will initially feed herself on nectar from early flowering plants and then her focus will be on founding her colony. Only a very small proportion of queens that are produced will go on to establish a successful colony as many of the queens will not survive the Winter. Hibernating queens will fall prey to predators, such as spiders and fluctuating Winter temperatures can cause the early arousal of queens, which then depletes their energy sources. Nest foundation: The queen’s race to establish her colony starts with the construction of the nest. As wasps do not possess wax producing glands, as in bees, she uses chewed wood pulp as the construction material. She will scrape wood fibres from tree bark, fences, sheds garden furniture etc. using her powerful jaws. She will then chew the wood fibres together with saliva to produce a type of papier mache, which she then uses to fabricate the initial nest. She will form around 20 to 30 cells within this nest, where she will lay an egg in each of these cells. These first eggs will hatch within a 5-7 days and the larvae will then be fed by the queen for the next 10-14 days. These larvae then seal off their cells with a silk spun cap and pupate within a cocoon, from which the first worker wasps emerge some 10 days later. Wasp nest growth: The emergence of these first workers allows the queen to concentrate her time and efforts into producing eggs as the workers take over all the other tasks within the nest. These first worker wasps are much smaller than workers produced later in the year as they will not be as well fed as the later progeny. There are a variety of tasks that need to be carried out by the workers such as nest construction, foraging, nest defence and housekeeping. This period sees a massive increase in the structure of the wasp’s nest, and it is probably at this stage that the constant to and fro of wasps that alerts people to the presence of a nest. Common wasp’s nests have a yellow tinge due to the preference of workers obtaining wood fibres form dead wood. The workers will also be foraging constantly for small insects to take back to the nest to feed the developing larvae, that require a protein rich diet in order to grow. The larvae will exude a calorific rich sugar solution, which in turn feeds the workers (this mutualistic feeding is known as trophallaxis). As the Summer temperatures increase, workers will be collecting water to deposit on the outside of the nest, which then cools the nest as it evaporates. The evaporation process is speeded up when the wasps rapidly beat their wings. Production of reproductives: The wasp nest reaches its optimum size during the Summer, which can number up to 10,000 wasps living in a nest that can be up to 3 feet across. It is at this point that the queen starts to produce eggs that will develop into new queens (gynes) and males (drones). Gynes are produced from eggs that are fertilised and males are produced from eggs that are unfertilised. Although workers (infertile females) are also produced from fertilised eggs, it is suggested that the gynes are fed a richer diet that results in their sexual development. The focus of the workers now changes to concentrate on the rearing of these drones and gynes, which means eggs/larvae destined to become workers are actively removed from the nest (worker policing). As the drones and gynes pupate, this drastically changes the dynamic within the nest. The worker wasps become increasingly redundant and instead of having to tend the larvae and nest, become free to forage for themselves. They actively seek out sweet food to satisfy their sugar craving and it is at this stage in the life cycle that wasps become much more of a danger. They make life a misery as they ruin outdoor activities such as BBQ’s, picnics etc. and enter kitchens and food retailers. Death of the nest: The founding queen dies soon after the gynes and drones are produced, which signifies the death of the nest. The gynes and drones will seek out reproductives from other wasp nests so they can mate, which ensures that interbreeding is minimised and the diversity of the gene pool is maintained. The newly mated queens are the only members of the colony that will survive. The founding queen dies, the drones die, and the workers die as. This breakdown and death of the colony is a gradual process that takes place over several weeks. Hibernation of the queens: The newly mated queens are the only caste of wasps that survive. They will feed voraciously in order to build up the energy stores required to survive their Winter hibernation. The queens will seek out nooks and crannies in which they can hibernate and sometimes they will choose suitable sites within our properties to see out the Winter. The advent of the warmer temperatures in Spring will awaken the queens and the life cycle will start again. Male wasps (drones) can’t sting because the sting developed from a modified ovipositor (egg laying tube) only found in females. There are around 9000 species of wasps in the UK. Most of these are solitary wasps that live a parasitic life. There are only 9 species of colonial wasps that are typically yellow and black and form colonial nests. The largest colonial wasp in the UK is the European hornet. The queen of this species can reach 35mm long. One of the largest nests ever recorded in the UK was over 1m across. There was one wasp nest found in New Zealand that measured over 3.7m long. The Asian hornet (Vespa velutia) was recorded for the first time in the UK in 2016. This is an invasive species that preys on honey bees and must be reported if found. Need a wasp nest removing?